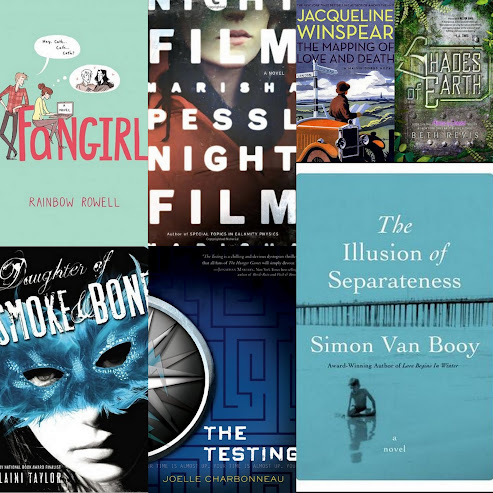 My Reading Year In Review – my books. my life. I was having a hard time just coming up with a number…ONE NUMBER…because I stopped doing reviews in the fall. But I did figure out I read 109 books. Of your list, I also had Night Film and the Rainbow Rowell books, and a couple of years ago I read (and loved) Fun Home. I am not 100% sure my number is accurate actually. And I am reading Fun Home now. just to let you know I am still reading your blog. 🙂 Thanks for the wee lists. I’ll add some of the books to my TBR list. I bought Night Film months ago and haven’t found time to read it yet. I hope it’s as good as Special Topics. I thought Night Film was even better than Special Topics. (And thanks for sticking with the blog!). If you count your runners up we have 4 that overlap! That seems like actually a lot for us. Wonderful post, Michelle! Enjoyed reading about your favourites and Ben’s favourites. I want to read ‘Fangirl’ and ‘The Illusion of Separateness’. Love Simon Van Booy’s prose. I loved ‘Eleanor and Park’ and ‘The Ocean at the End of the Lane’ too – nice to see them on your runners up list. Nice to see ‘Death in Venice’ on Ben’s list. I enjoyed reading it, especially for Thomas Mann’s prose. I want to read an Alison Bechdel book sometime. Thanks for sharing your lists. Happy New Year! Looking forward to your post tomorrow. Simon Van Booy is the best. Great selections, I’ve only read two of your top 7 (Fangirl and Night Film) but I loved them as well. Great choices by Ben too – I love Great Expectations and Fun Home. I’m very impressed that you read 62 books with an infant/toddler! Highly impressive! I am reading Fun Home right now. I am not entirely sure how much I read to be honest. I did a very bad job keeping track this year. 😦 I really liked The Night Film, though. That will be on my best of list. I am listening to Fangirl right now and it is really well-done on audio. I’ve heard that Fangirl was a good audio. I’ll have to give it a listen someday. I’m listening to The Ocean At The End of The Lane right now. I’m really enjoying it. It’ll probably be on my 2014 best of list. I wish I had done the audio. Maybe I’ll reread it in 2014. The Daughter of Smoke & Bone has ended up on a few lists and I think I MUST read it soon. It sounds so good! Happy New Year, Michelle! It really is surprisingly good. And the audio is fantastic. I always enjoy reading end of the year recap posts! 🙂 It’s so nice to see your favorites and I caught up on some reviews I missed. My reading year wasn’t very good. I read 30 books and I often had a hard time picking books to read…that’s probably the reason why I ended up reading some books which had been on my tbr list for AGES. I think getting to your TBR is a success. I always have a hard time with books I’ve wanted to read for a long time because I get distracted by new ones. We have only one top book in common if you count your runners up. I do have two of the Rainbow Rowell books on my ereader and can’t wait to read. I don’t keep page or reading time stats….too much work…I do love that you show me different books to read…thanks!! Goodreads is the only reason I have any stats. I am awful at keeping my own. I can’t believe that out of your favorites i’ve only read Night Film and Where the Stars Still Shine. I have some reading to do! Great list and we have a few in common. There are definitely some books on your list that I should add to my queue.